Don't deprive yourself. It's called a holiday for a reason. The minute you start limiting what you eat, the minute you start craving it even more. At least, that's what happens when I create rules for myself concerning food. I pretty much try every dish at holiday meals, I just have a really small portion of each. So indulge, my friends. Indulge. 2. Got a favorite? Make it yourself! If you know there is a trigger food that you can't resist (mashed potatoes, apple pie), offer to make it yourself. This is beneficial for two reasons. First, you can make a lighter/healthier version of the dish (try this green bean casserole, or this sweet potato casserole). Secondly, if you spend the time making the food yourself, you might be less inclined to eat a lot of it since you get to see what it consists of (like the cream of mushroom soup in green bean casserole - yuck). 3. Splurge on the best. Try to really think about what you're eating. Are you really going to waste 400 calories on that store-bought spinach dip that you can buy for yourself and eat anytime? No way. But Grandma's Once a Year, Homemade Coffee Cake? That's worth splurging for. This tip is actually something I use all the time. I usually pass on the wal-mart cupcakes at our office parties, but when someone brings a homemade chocolate cake, I'm first in line. This is kind of a "duh thing," but completely worth mentioning. Step up your exercising a little bit so you don't have to feel guilty if you eat a little too much. You're obviously not going to lose weight by doing that, but hopefully you won't gain weight either. Drinks are crazy-full of calories. Even if you don't drink soda (and you shouldn't - it's so bad for you), the drink calories really add up. Alcohol, sweet tea, eggnog (so fattening and so delicious), hot cocoa - it all has empty (won't keep you full) calories. So limit yourself. Sip that holiday punch for a few hours. Think of eggnog as a dessert. Choose water to drink with your meal. 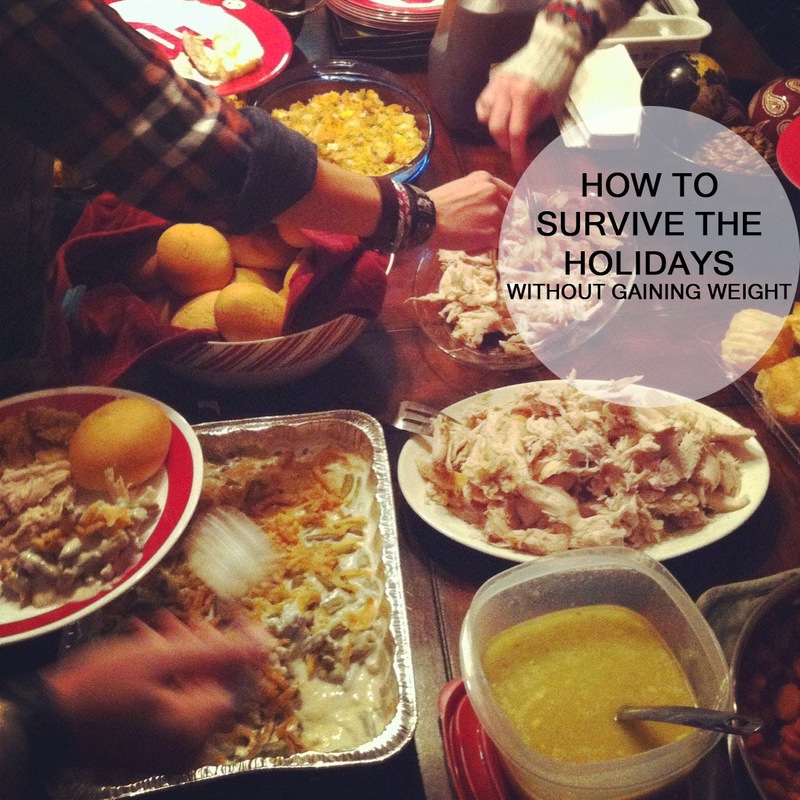 What are your tips to surviving the food frenzy during the holidays? My rule over the past year has been that if I want to indulge, I ought to move my body first. I ALWAYS feel better eating a special meal if I've been active earlier in the day. Sort of a mental thing, but it has worked really well in helping balance my portion control as well when it comes to serving out those indulgent meals. Great tips! I think what really gets me is all the goodies that people give you for gifts. Like cookies or candies from co-workers. Then they are sitting in my house and I just snack on them because I sort of feel obligated. I don't go nuts and eat them all at once but it is still extra snacks that I wouldn't have otherwise, know what I mean? Ha, that make it yourself tip totally works. I looove dessert foods, but when I make them myself it kind of grosses me out just how much butter and sugar go into everything. Number three is such a good way to approach the holidays or parties in general! Though when I make things myself I tend to eat portions of every ingredient that goes into. It kind of works out though because then I'm not as ravenous come meal time. 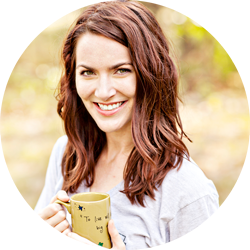 These are such great tips - it's so easy to forget and just keep munching!